If you’re looking for a simple and minimally invasive procedure to instantly revamp your smile, porcelain veneers may be just the thing for you. A cosmetic dentist in Indianapolis can help you correct the flaws hurting the appearance of your smile for a brighter, straighter smile in just one office visit. If you’re considering porcelain veneers, we have everything you need to know about the cosmetic procedure. Veneers can be used as both a cosmetic and restorative procedure. For those who don’t like the appearance of their smile, they can quickly hide the flaws using veneers. For those who have damaged teeth, veneers can sometimes be used to treat the damage while stopping the need for additional restorative procedures. Porcelain veneers are used in dentistry to enhance the appearance of your smile. Using very thin porcelain shells, you’ll transform your smile by attaching the false fronts to the front side of teeth through a bonding process. With porcelain, you’ll get a brighter, whiter smile that closely mimics your natural teeth as light reflects better off porcelain than composite veneers. Since porcelain veneers are thinner and lighter weight, less tooth structure is removed during the bonding process and you’ll barely notice they are there. Porcelain veneers can be used to correct a number of problems that hurt the appearance of your smile. Commonly, they are used to hide certain defects of the teeth, such as chips, cracks, and misshaped teeth. They can also be used to fix minor alignment issues and fill gaps while instantly hiding discoloration. 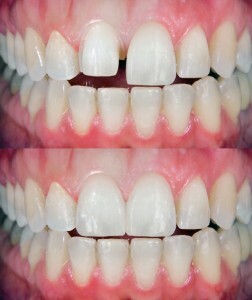 The use of veneers are customizable so they are able to create more proportionate tooth sizes. What is involved in a veneer procedure? If you’re a candidate for veneers, you’ll first require and initial appointment to create your custom veneers. Images and molds are taken to create the false fronts in the lab. To attached the false fronts, your teeth will be cleaned and prepped. Prepping the teeth involves etching the surface by removing small amounts of enamel to allow for a secure bond. Then, bonding material is used to bond the veneers to the tooth. Your tooth will be cleaned and polished while we ensure the bite and function are correct by making minor adjustments. Does dental insurance pay for dental veneer procedures? Since porcelain veneers are considered a cosmetic procedure, most insurances won’t cover the cost. As an elective procedure, it will require you to pay for the veneers out of pocket, which can cost $925-$2,500 per tooth, but with the right care, they can last 10 to 15 years so you’ll actually make an investment in your smile. Indianapolis Family Dentistry is your hometown cosmetic dentist in Indianapolis for porcelain veneers. We will give you a radiant new smile using the veneers to smile brightly. We will create an individualized treatment plan to ensure your smile is esthetically pleasing while maintaining function and oral health. Call us today at (317) 622-6605 to schedule a consultation.